The Liverpool Hotel Rimini All Inclusive is the first Experience Hotel in Rimini, a structure where to live unique and unforgettable experiences. Near the beach, has parking, WI-FI throughout the entire hotel and air conditioning in the room. Admits pets of all sizes. The hotel is located near the beach of Rivazzurra, a lively village in the south of Rimini. 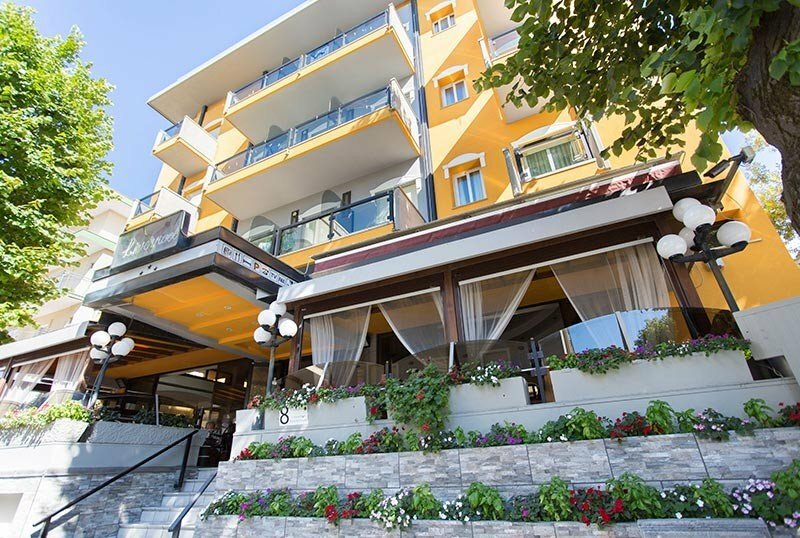 Nearby are: Viale Regina Margherita with shops and clubs, the theme park of Fiabilandia and the bus stop n. 11 that connects the hotel to Riccione and to the center of Rimini. The rooms have a balcony, air conditioning, WI-FI, safe, TV with digital terrestrial, private bathroom with shower and hairdryer (on request, free of charge). On request rooms with sea view balcony. FAMILIES: family rooms are available. The hotel has a open-air porch, sun terrace, lift, reading room with newspapers, conference room, newspapers available, free use of bicycles. Theme nights are organized. PARKING: uncovered and free, available subject to availability. WI-FI: free throughout the entire structure. AIR CONDITIONING: available throughout the structure. CONVENTIONS: beach, amusement parks, discotheques, cquascivolo. Paid organized excursions. PETS: free admits of animals of all sizes. BREAKFAST: sweet and savory buffet, homemade desserts. LUNCH AND DINNER: 3 or more choices menu, vegetable buffet, finger food. In the hotel: guided e-bike tours. At meals: baby menu, baby food, seats at the table. On the beach: equipped playground, live entertainment, nursery. Guests can choose from 8 different experiences: a magical picnic among the olive trees, a dinner on the beach pampered by the chefs of the seafront restaurant, an aperitif on a sailboat at sunset, a dream dinner in the field of pumpkins and corn, a beautiful e-bike tour with guide in the Romagna hinterland, a wonderful day of fishing by boat, a romantic dinner at the castle of Gradara in the best restaurant in the Romagna hinterland, a fabulous tasting of wines and typical products in the best winery in Rimini. This hotel has a variable price list. to ask for an estimate fill in the form here on the right, it's free and without obligation! - a child up to 3 years sleeping in the Latvian with mum and dad does not pay! Take advantage of the offer immediately before Scada or end the availability of the rooms.!. We are waiting for you, contact us now! Visit the Fiabilandia Amusement Park, in fact we are only 5 minutes walk from the entrance. Hurry up and don't miss the offer! Choose the Experience you want to experience!